"This is a pretty good spot for a quick teriyaki fix. It's really hard to find a good fast-food type of teriyaki joint, but Toshio's does an excellent job of serving up good quality food at a reasonable price." "This is my favorite teriyaki I've been going here for YEARS." "I love me some Toshio's! They have the best teriyaki sauce and salad dressing! I also love how they leave the skin on the chicken. That's where all the flavor is! Portions are huge and cheap!" "Hello, my name is Dominic Carter and I've been coming to eat here since 1990 with my wife and kids. I've traveled all over the U.S. and no ones teriyaki compares. Keep up the great service and great food." Dominic Carter, customer for life. "Toshio's is like coming home--in spirit, health, and sustenance! I feel fed in mind, heart, body, spirit when we eat Toshio's. Great family, locally owned, doing great things for our community and each and every customer! Thank you -- here's to many more years!!!" "I like the people who work and own the famous Toshio's. The food is delicious. The place is clean and that is a plus. 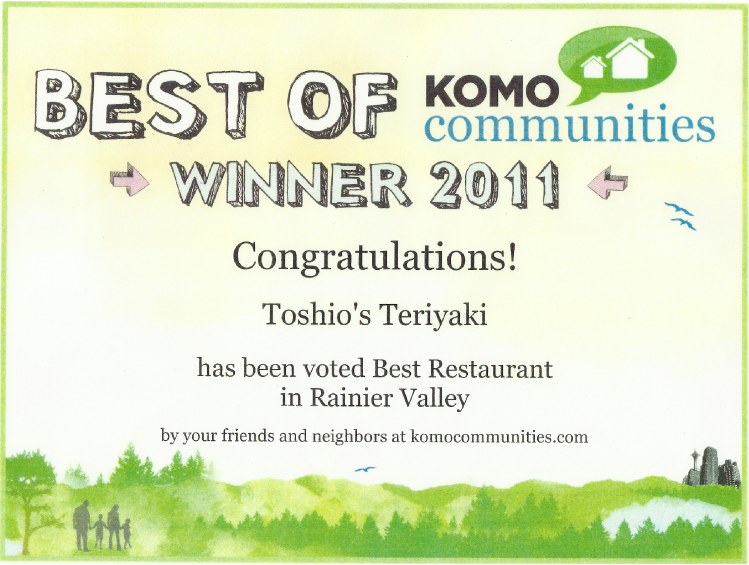 Toshio's is a great place to come and eat at." "I love you guys. Not only the best teriyaki, but also incredibly kind and attentive. You always go above and beyond which I appreciate. For example, when I accidentally forgot my wallet, you helped me get in touch with my husband to pay by phone. Thank you for the great food & service." 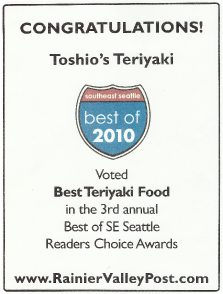 "I've been to Toshio's Teriyaki twice and would highly recommend it. The service was fast & friendly and the teriyaki is excellent. I had a health condition that was chronic and with the prayers and laying of hands by Ms. Toshio my condition is all but gone. Thank you Toshio-san."